Posted on September 27, 2018 at 3:45 pm. 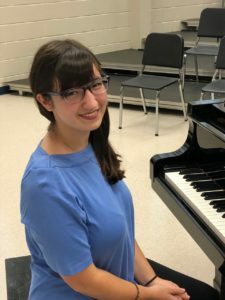 H-B Woodlawn Secondary Program senior Grace Goldman was named to the National Association for Music Education’s (NAfME) 2018 All-National Honor Ensembles. Goldman will perform with other student honorees at Disney’s Coronado Springs Resort at Walt Disney World in Orlando November 25-28. A devoted singer, Goldman is extremely honored to be participating in the All-National Honor Choir. She has been singing since she was a small girl and has participated in H-B Woodlawn choirs since sixth grade. She has also participated in multiple choirs outside of school, including Choralis, All-District Choir, and All-Virginia Chorus in numerous past years. The All-National Honor Ensembles (ANHE) performers represent collaboration and creativity in its highest musical form. The All-National Honor Ensembles consist of a jazz ensemble, mixed choir, guitar ensemble (new this year), symphony orchestra, and concert band. Students were chosen through an audition process. The jazz ensemble will have 20 instrumentalists, the mixed choir 240 vocalists, the guitar ensemble 47 guitarists, the symphony orchestra 122 instrumentalists and the concert band 121 instrumentalists. Eligible students have qualified for their state-level honor ensemble program (not applicable to guitar students) and competed against top students for a spot in these national honor ensembles. Selected students will be rehearsing a challenging repertoire in preparation for performing under the baton of five of the most prominent conductors in the United States, including: Todd Stoll (Jazz Ensemble); Dr. Amanda Quist (Mixed Choir); Dr. Michael Quantz (Guitar Ensemble); Dr. Jean Montès (Symphony Orchestra); and Dennis Glocke (Concert Band). All conductors have received top honors in their field and will spend several days rehearsing with students before the concert.